Hamas supporters chant slogans while raising their hands up during protest against President Donald Trump's decision to recognize Jerusalem as Israel's capital, in Jebaliya Refugee Camp, Gaza Strip, Dec. 8, 2017. The cloud over Palestinian aspirations created by the U.S. recognition of Jerusalem as the capital of Israel may have had a silver lining: the announcement served to distract from the failure of Fatah and Hamas to meet their self-imposed deadline for reconciliation. President Donald Trump’s Dec. 13 announcement came just three days after the date that had been set by the rival Palestinian factions for the handover of government ministries and key security responsibilities in the Gaza Strip from Hamas to the Fatah-led Palestinian Authority, which was driven out of the coastal enclave in 2007. Even after a 10-day extension, the deadline for a reconciliation deal passed with no announcement, a failure that was quickly overshadowed by the U.S. decision on Jerusalem. Masked militants from Al Aqsa Martyrs' Brigade, a militia linked to the Fatah movement, hold their rifles and the Palestinian flag during a protest to condemn the decision by President Trump to recognize Jerusalem as Israel's capital, in Gaza City, Dec. 7, 2017. Ghaith al-Omari, senior fellow at the Washington Institute for Near East Policy, echoed Stock’s sentiment. The Palestinian territories have been effectively split since a violent struggle in 2007, with the Palestinian Authority controlling the West Bank and the more militant Hamas in control of the Gaza Strip. However the two agreed on Oct. 12 to begin negotiations on reunification, with Egypt serving as mediator. Hamas’ decision to effectively cede power was driven by an ongoing humanitarian crisis in Gaza. A combination of Hamas's poor governance, sanctions imposed earlier this year by the PA and Egypt’s closure of its main border crossing with Gaza had left Palestinians trapped in the territory with little access to electricity or international aid. The proposed reconciliation has afforded the Palestinian Authority, run by President Mahmoud Abbas’ Fatah Party, the opportunity to return to full governance of the territories. That in turn would legitimize its claim to represent all Palestinians — a point of historic contention in peace talks with Israel and the international community. 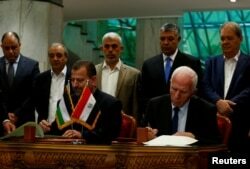 The reconciliation agreement stated that the PA would remove all punitive sanctions against Gaza in exchange for assuming full administrative control, while some Hamas personnel would be merged into the new PA-controlled ministries. The two sides agreed to meet again in Cairo on Nov. 21 to discuss the logistics of the partnership, centering on the formation of a unity government. But before the Cairo meeting, Hamas distributed roughly a third of its territory to armed militias, including its own military wing. 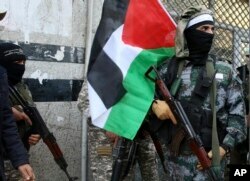 Fatah interpreted the move as an indication that Hamas would not honor its agreement to cede control of the territory. Hamas, for its part, feared that Fatah had little intention of integrating the organization into the political process once the PA regained administrative control. FILE PHOTO - Head of Hamas delegation Saleh Arouri and Fatah leader Azzam Ahmad sign a reconciliation deal in Cairo, Egypt, Oct. 12, 2017. When Hamas and Fatah reconvened again on Nov. 21 and 22, they addressed issues of national unity, Israeli behavior, and their shared aspiration to be an independent Palestinian state based on the 1967 borders — a goal accepted by Hamas for the first time in a new charter earlier this year. Notably, the organizations declared that the Palestine Liberation Organization (PLO) is the sole legitimate representative of the Palestinian people and agreed to hold general elections by the end of 2018, leaving the exact date to the discretion of President Abbas. Hamas and Fatah agreed to continue talks in February in coordination with Egypt. The restoration of PA authority in Gaza was to have been completed by Dec. 1, a deadline that was later pushed back to Dec. 10. But as the year winds down, Hamas remains in control of the Gaza Strip and the PA sanctions against Gaza remain in place. With difficult questions about the future of Hamas’ security forces and its network of smuggling tunnels still in question, the sides cannot agree even on whether administrative control of the ministries in Gaza has been completed. Hamas claims to have handed control of all government ministries to the PA, but PA spokesman Yousef Mahmud, quoted in the Times of Oman, said his organization had not yet received full control of key ministries. Despite the impasse, analyst Khaled Elgindy of the Brookings Institute said it is important to take the long view on the reconciliation process.